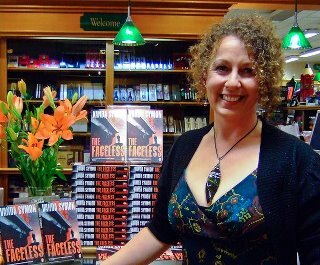 Leading New Zealand crime writer Vanda Symon, who has previously been a finalist for the Ngaio Marsh Award, and is the author of impressive thriller THE FACELESS, as well as the Sam Shephard series of crime novels, will present the 2013 Davitt Awards in Melbourne next month. Readers’ Choice (as voted by the 600 members of Sisters in Crime Australia). “There are a staggering 37 adult novels in contention, which is the largest number ever – up 16, from last year. Clearly the muse was providing female crime writers with a lot of inspiration in 2012!,” said Tanya King-Carmichael, the Davitt Judges' 'wrangler'. This year, the inaugural Lifetime Achievement Award will also be presented. The Davitt Awards are presented by Sisters in Crime Australia for the best crime books written by Australian women. The ceremony will be held at the Thornbury Theatre in Melbourne on 31 August 2013. Prior to the award presentations, Symon will discuss her life in crime with Professor Sue Turnbull. Symon started out as a pharmacist and turned to writing when she was at home with young children. Symon was an international guest at SheKilda, Sisters in Crime’s 20th anniversary convention, in 2011. Sue Turnbull is Professor in Media and Communications, University of Wollongong, a Sisters in Crime national co-convenor, and crime columnist for the Sydney Morning Herald. For more information on the longlisted books, click here.